Mount Ruapehu is a notoriously unreliable destination for skiers, and even the best-laid plans unravel when the weather turns bad. To offset the risk, forget about hiring a ski lodge – take a motorhome. When skiing conditions turn to custard (as happens with regular monotony at the mountain), one always feels a little cheated. You've driven all that way, hired the lodge and stocked up with provisions, and so feel obliged to stay - very boring. A motorhome's a much smarter alternative. Think about it: it's your transport (it even has snow chains), accommodation, kitchen, entertainment centre and drying room - all rolled into one. With efficient heaters and good insulation, it's very snug. And the cost of hiring one is insignificant when shared between a party of four or five. Furthermore, there's no shortage of campsites around Mt Ruapehu, and compared with a ski-lodge, a campsite's dirt cheap. And because you don't have to book a site weeks in advance, your skiing trips can be a lot more spontaneous. If (when) the weather turns, you simply move to a more pleasant environment/activity. Case in point: skiing didn't happen on our recent long-weekend visit to the mountain. But we'd packed our golf clubs and ventured on to the nearby courses. 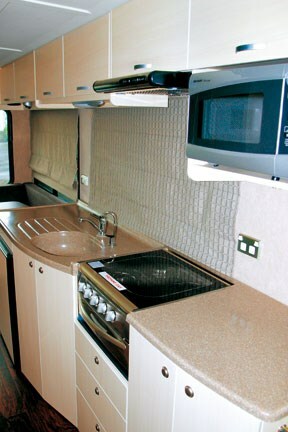 We travelled in KEA's new (2008) six-berth motorhome - the company's largest model. Numerous factors make it the ideal skiing companion. Very spacious, it's the ideal vehicle for a family or three couples (it has three double berths). It's riddled with lockers for bulky ski gear (including a nifty ski/snowboard locker at the rear). 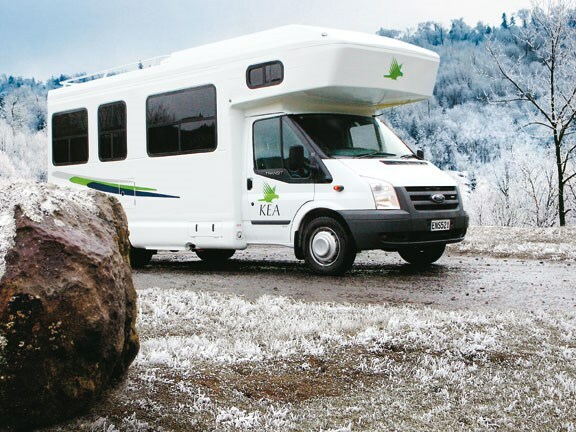 Like all KEA motorhomes, it's also fully self-contained, so you don't even have to stay in a campsite if you don't want to. Best of all though, with a gross vehicle mass of 4.25 tonnes, you can drive it on a conventional car licence - and despite its somewhat intimidating bulk, it's a pleasure to drive. We drove through some of the most awful conditions - going and returning - I've experienced in a long time: non-stop rain and howling wind. And it was the wind's lack of effect on the KEA's aerodynamics that most surprised me. I'd anticipated a white-knuckled duel-with-the-wheel but with power steering it's not an issue. The vehicle is supremely stable and runs true. She's built on Ford Transit T430 chassis (dual rear wheel configuration) and powered by a 2.4-litre, turbo-charged, intercooled diesel. It's mated to a six-speed manual transmission, and the package provides a smooth cruise-speed of 100km/h at 2500rpm. ABS braking is standard. She responds briskly to the accelerator and on only a few occasions did I have to change down to fourth - it climbed most hills (the wind notwithstanding) in fifth easily. So you're spared the awful sense of guilt that comes with leading a long queue of traffic up a winding hill. The tank holds 80-litres and our fuel consumption (with the air-con working overtime to clear the condensation) worked out at around 6.5km/litre - a range of about 500km. It's a quiet engine and doesn't intrude on conversation or music. 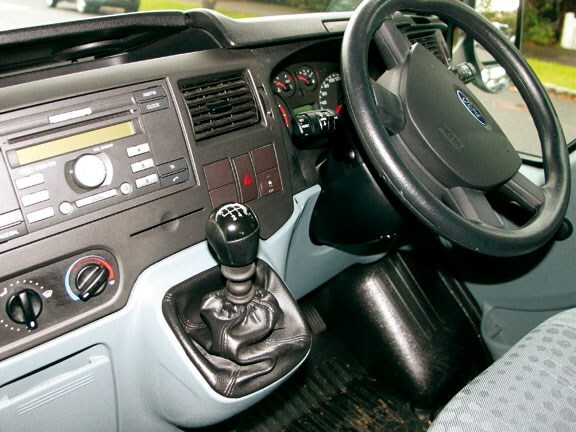 Ford's cab layout is uncluttered and well thought-out, with plenty of features designed to simplify the driving experience. I particularly liked the fold-out centre tray with recesses for coffee mugs. Tall side-mirrors offer good views of the action behind, and there's a small LCD screen built into the driver's sun shade. It's automatically activated when you select reverse, and courtesy of a small camera mounted at the rear end of the roof, facilitates backing into a tight campsite or parking bay. The separate driver and passenger seats are set well back from the dash, so it's a no-fuss through-step into the accommodation area. The stylish design of the accomodation area has masses of volume and headroom. There's a four-seater "cabin" for passengers immediately behind the driver's seat, then the bathroom, and a six-seater dining area at the rear. Opposite the four-seater is the kitchen. Skiers tend to be simple souls with minimal needs, but if gourmet cooking is your thing, you'll be well served in this KEA. The kitchen's equipped with a microwave, four-burner gas hob with range hood, grill and a 130-litre fridge/freezer, and expansive, easy-clean work surfaces. The microwave needs the 230-volt supply at the campsite. The clever design continues in the bathroom. 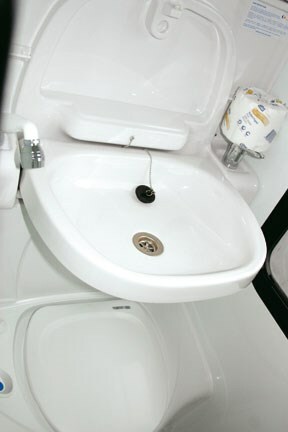 It's a roomy toilet/handbasin/shower combo, and its central piece is the one-piece handbasin that folds up against the bulkhead when you want to use the toilet or shower. For skiers, a built-in, fold-out rack allows the bathroom to be used as a drying room. The KEA carries 150 litres of fresh water, with a 150-litre wastewater tank and a cassette toilet. Bulkhead monitors help to remind you when tank levels are running low/high. The biggest of the double berths (above the cab and accessed via a short, clip-on ladder) measures 2.1m x 1.7m. The second (longitudinal) bed (1.9m x 1.3m) is deployed by re-arranging the four-seater - and it's a quick, simple exercise. Seats and backrests fold neatly into one another - you don't have to fit additional squabs. 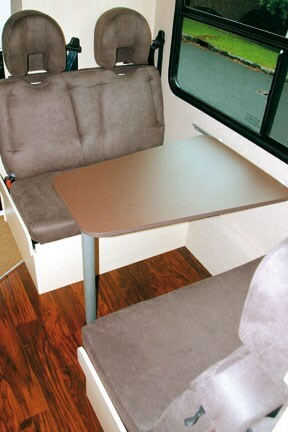 At the rear, the dinette collapses and becomes the third bed (2.1m x 1.5m). There's a good supply of quality linen, blankets and duvets. Sleeping "outdoors" in sub-zero temperatures might sound daunting, but thanks to excellent insulation, the KEA quickly becomes snug and cosy. You have a choice between a gas heater and a 230-volt model. When the red wine runs out, you can watch TV (all the free-to-air channels), but if that doesn't satisfy you, hire a DVD and watch it on the slide-out LCD screen. 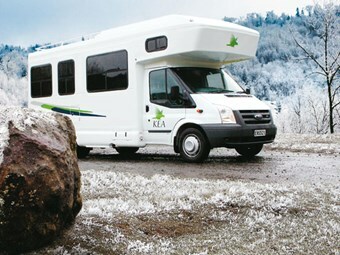 KEA motorhomes (of various sizes) are available for hire from depots in Auckland and Christchurch. Given its space, power, easy driveability and car license-only requirement, the six-berth model is particularly appealing - and if you really like it, you can buy a new one for around $149,000 - fully equipped.